"May this be a symbol of the love,support and encouragement that you show me everyday. I love you, Mom." 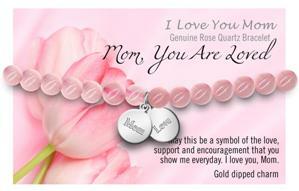 Real rose quartz bracelet with white gold dipped mom and and love charms.